Raging Babe Events made their Philly promotional debut at the 2300 Arena in South Philly Friday night . Raging Babe Events is headed by Michelle Rosado and J. Russell Peltz acted as the matchmaker. 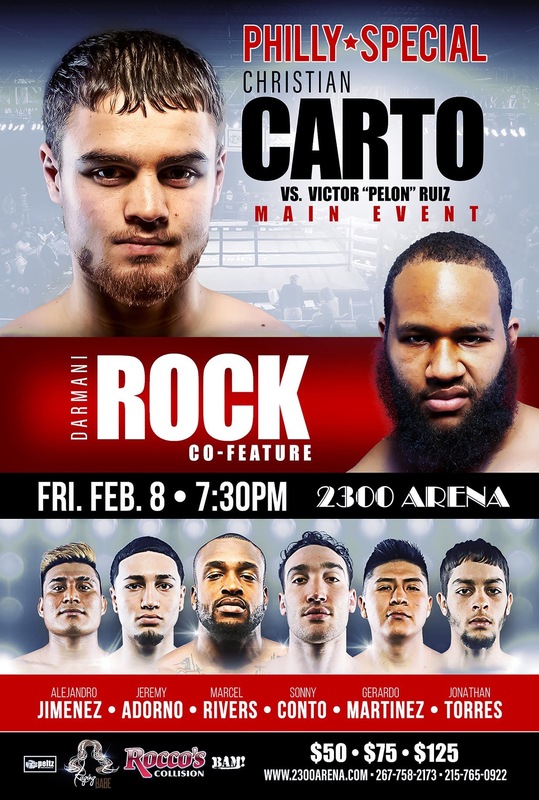 In the Main Event previously unbeaten Christian Carto was knocked out in the second round by 3-time world title challenger southpaw Victor “Pelon” Ruiz before a standing room only crowd. “A change of trainer’s three fights ago backfired!” That was from one of the Carto fans. Another watching it on Facebook said “changing trainers came back to bite him.” “Since leaving trainer Mickey Rosati after five years Carto went from a boxer-puncher to a straight ahead puncher and was taking head shots like never before,” said another. In the opening round after a minute Ruiz landed the first solid punch a lead left to the body. Carto landed a lead right on the chin. Carto landed a lead right to the body. Ruiz landed a left uppercut on the chin as Carto came in. In the second round Ruiz walked into a left hook on the chin. Both fighters landed body shots. Ruiz missed a right hook but landed a following right. Ruiz landed a thunderous overhand left hook on the chin and Carto went down and out! The replay was never shown on the screens afterwards. Ruiz had lost five of his last six fights getting knocked out in his last fight in October in the first round. In the six fights the opposition had a 103-35 record. Carto laid flat on his back for some twenty minutes before being put on a stretcher and taken to Jefferson Hospital. Philly heavyweight Darmani “Solid” Rock, 14-0 (9), stopped Steven “The Lion King” Lyons, 5-4 (2), of Larose, LA, at 1:20 of the fourth round. In the first round Rock used a jab and a right to the body backing Lyons up. Lyons had a hard left hook blocked by Rock. Lyons landed a left hook on the chin of Rock. Rock with his left to his side used an effective jab. In the second round the bigger by 64 lbs. Rock landed a right cross to the chin of Lyons that had no effect. Rock drove Lyons back with a lead right to the chin. Lyons landed a double left hook on the chin of Rock. A Rock right on the chin drove Lyons against the ropes. In the third round Rock started clowning and the fans didn’t appreciate it. He would take a southpaw stance and do little with it. There were few punches landed but Lyons got in as many as Rock. In the fourth round Lyons landed a left hook followed by a right to the chin driving Rock back several steps. A solid right to the mid-section from Rock and down went Lyons taking the full count on his knees until referee Esteves waved it over. Lyons got up immediately. The fans were not happy. It was a lack luster fight with a bad ending. In the co-feature Welterweight Marcel “Hard-Roc” Rivers, 7-0 (4), of N. Philly, defeated southpaw Derrick “Bad Boy” Whitley, II, 4-1-1 (0), of Springfield, MASS, over 6 rounds. In the first round Rivers landed a right uppercut on the chin of Whitley. Whitley landed a right hook on the chin during the break and was warned by referee Benjy Esteves, Jr. In the second round Rivers ran into a left on the chin from Whitley. Rivers landed a right uppercut to the body. Whitley came back with a flurry driving Rivers against the ropes. Whitley landed a right uppercut to the body. Rivers backed Whitley against the ropes with several body shots. In the third round Rivers ducked into a right uppercut on the chin. Rivers landed a combination to the body. Whitley landed a combination to the body and was countered by a Rivers body shot. In the fourth round Rivers landed a combination to the body. In the middle of the round a “fight broke out” with a good exchange! Rivers landed a flurry to the body of Whitley. Rivers landed a right uppercut on the chin. Rivers landed a lead right to the chin. In the fifth round Rivers landed a lead right to the body a minute into the round. Too many clinches in this fight. Rivers landed a left uppercut on the chin getting a roar from the Philly crowd for the hometown fighter. Whitley came back with a combination to the head. Seconds later Whitley landed a right uppercut to the chin. In the sixth and final round Rivers came out with a double jab on the chin of Whitley. Rivers landed a right knocking out the mouthpiece of Whitley. Rivers ended the round wit right cross to the chin of Whitley. Whitley came back with a lead left to the chin of Rivers. Whitley seemed to have as many fans brought down from MASS’s as Rivers had here. Too much holding by Whitley in this one and Rivers seemed confused fighting a southpaw. His trainer is Fred Jenkins, Sr. a PAB HOF trainer. Scores were 58-56 by all 3 judges, Weisfeld, Braswell and Ruben with this writer 57-57. Super bantamweight Mexico’s Alejandro “El Grande” Jimenez, 4-0-1 (1), New Hope, PA, drew with southpaw Edgar “Double Trouble Cortes, 6-4-1 (0), of PR/Vineland, NJ, over 6 lackluster rounds. In the opening round there wasn’t a punch landed for a minute until Cortes landed a lead left to the chin. There was very little action in the round. In the second round Cortes missed a left but followed through landing a right on the chin. Both boxers were too tentative. In the final seconds Jimenez landed a flurry of punches driving Cortes into the ropes at the bell. In the third round Jimenez missed a right but followed through landing a left to the chin. Halfway through the round both finally got into a good exchange. Jimenez walked into a left uppercut to the body from Cortes at the bell. In the fourth round Cortes missed with a right hook and got countered by a right on the chin by Jimenez. Cortes landed a solid straight left on the chin of Jimenez getting the crowd into it. Jimenez landed a lead right on the chin. Cortez landed a hard right hook on the chin seconds before the round ended. In the fifth round Cortes walked into a right on the chin from Jimenez. Cortes landed a right hook to the chin. Jimenez came back with a right cross on the chin at the bell. In the sixth and final round Jimenez was warned by referee Dali for coming in with his head. Cortes landed a right hook to the chin seconds before the end of the round and fight. Dali was the referee. Scores were Braswell 57-57, Weisfeld 58-56 Cortes and Brazinski 58-56 Jimenez with this writer 57-57. Bantamweight Jonathan Torres, 2-0 (0), of PR/Bethlehem, PA, defeated Dallas Holden, 1-4 (0), of Atlantic City, NJ, over 4 lackluster rounds. In the opening round Torres showed good movement as Holden was chasing him. Torres rocked Holden with half a minute left in the round with a straight right on the chin. In the second round Holden continues to hold and rabbit punch Torres. Torres rocked Holden with a right on the chin halfway through the round. Torres missed a right but followed through with a left hook to the chin of Holden. In the third round Holden landed a double jab to the chin. While in the infighting Torres landed a right cross on the chin of Holden. Referee Eric Dali warned Holden for using his head. In the fourth and final round Torres landed a left uppercut to the chin of Holden. Holden landed an overhand right on the chin rocking Torres. Seconds later another right from Holden landed on the chin of Torres. Scores were 40-36 by all three judges and this writer. Super lightweight Haitian Osnel “Prince” Charles, 12-19-1 (2), of Atlantic City, NJ, lost a hard fought majority decision to Mexico’s Geraldo Martinez, 4-1 (1), out of Coatesville, PA, in a 4. In the first round Martinez used en effective jab until Charles landed a right on the chin. Midway through the round both fighters slugged it out in the middle of the ring with Charles getting an edge. In the second round Martinez drove Charles into a neutral corner until Charles landed a hard left hook to the chin. Both fighters exchanged right uppercuts. Martinez drove Charles against the ropes with a flurry of punches. With his back to the ropes Martinez landed a counter left hook on the chin of Charles. Near the end of the round both fighters got their licks in. In the third round Martinez came storming out backing up Charles until a counter right from Charles landed on the chin. Charles buckled the knees of Martinez with a right on the chin that got the crowd into it. Martinez landed a right while Charles countered with a left bloodying the nose of Martinez. In the fourth round and final round Charles came out landing a right uppercut. Martinez came back driving Charles against the ropes making him hold. Suddenly Martinez started dancing away. Charles caught up to him and it turned into a slugfest. Charles landed a combination to the chin getting the people into it. Martinez drove Charles into a corner. Both fighters were throwing punches at the bell as referee Benjy Esteves, Jr. had to seperate the fighters throughout the bout. Scores were 38-38, 39-37 and 40-36 with this writer 39-37. After 32 fights fighting in a 4 rounder it’s time for Charles to call it quits. Martinez is trained by Jimmy D’Orio with Joey Rowan the assistant. Heavyweight Sonny Conto, 1-0 (1), of S. Philly, stopped Jimmie Levins, 0-5 (0), of Buffalo, NY, at 2:14 of the first round. In the first round Conto showed a good jab with Levins looking for a way out. Levins slipped to the canvas two times and a third time by a left hook dropping him before referee Dali called in the ring physician who called a halt due to a jaw injury. Dali called the knockdown a slip. If he slipped someone hit him hard enough on the jaw to stop the fight. Levins should be suspended forever. He looked like he was stepping into cement from the time the first bell sounded. Conto is trained by Mickey Rosati and Conto’s father Frank with Joey Eye in the corner as cut-man. The Conto fans were numerous. He is trained by Mickey Rosati and Conto’s father Frank Conto with Joey Eye as cut man. David McWater the manager and Top Rank the promoter.